On-site shredding is the obvious choice for any business looking to ensure high levels of data protection and document security. Whether you’re disposing of confidential papers or media, such as disks or thumb drives, an on-site shredding policy is the only way to ensure that you’re fully compliant with local law. An on-site shredding service is a uniquely convenient way to dispose of documents or media that are no longer required. As the service comes to your premises it requires only minimal management internally, with little or no time commitment from in-house staff. Lockable bins are provided for the waste so that in between on-site shredding scheduled visits, documents can be safely stored and are ready when it’s time for the next disposal. Legally speaking, every business now has a heightened obligation to ensure that sensitive or personal data is properly disposed of. The definition of what constitutes sensitive or personal data has been considerably widened and so, as a precaution, any documents for disposal should be safely shredded. On-site shredding is the only way to ensure that there is minimal risk to documents and data within your care. As everything is carried out on the premises, vulnerability is minimised as the data is never in transit. 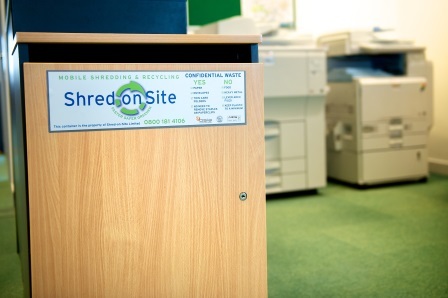 Tasking employees with handling shredding is rarely, if ever, a cost effective way to approach this crucial process. You are likely to pay much more to have one of your contracted employees spend time on shredding than by using an on-site shredding service. Plus, that staff member’s skills and talent are highly likely to be much more valuable when directed elsewhere. If it’s your own time that is involved then by working with an on-site shredding service you can optimise how you spend your day by leaving the shredding to someone else and focusing on your business instead. It’s amazing what the simplest documents can reveal to competitors who are looking to gain an advantage of your enterprise. Something as basic as meeting minutes could reveal a new hire or a prototype that is currently in development. It’s crucial to keep all business information confidential and the only truly dependable way to do this is to shred on-site so that it never leaves the premises whole. No matter what the size of your business, on-site shredding offers a unique set of key benefits that will contribute to efficiency and growth. We understand the needs of our customers and can help you to find exactly the right shredding options for you.